As humankind prepares to take another "giant leap," perhaps we should ask whether we've left out one small step? The International Space Station, or ISS, is here—at least partly. However, unlike Arthur C. Clarke's vision of the future as depicted in the 1968 science fiction movie 2001: A Space Odyssey, it is not to be an elegant, spinning, wagon-wheel-shaped structure producing artificial gravity for its occupants. Rather, its looks have been likened to a complex of mobile homes stuck together like so many old tin cans. Despite this, ISS is the most complex engineering project ever undertaken. It will be close to 100 meters long and weigh more than 450 metric tons (about one million pounds) when completed—a technological marvel orbiting the earth every 90 minutes at an altitude of around 220 miles. Due for completion by the end of 2004, the station is to accommodate seven astronauts and provide a permanent human presence in space. Its designers hope the project will serve as a model of international cooperation. Plans call for the first three occupants to take up residence in November 2000: ISS commander Bill Shepherd, Soyuz commander Yuri Gidzenko and flight engineer Sergei Krikalev. The ISS will provide unique laboratories in the weightless environment known as microgravity, allowing advances in medical research and industrial processes. It will also serve as the first stepping-stone in the manned exploration of the solar system. This all comes at a price, however. The cost to the 16 nations involved in the project is expected to be almost US$50 billion, not including the cost of the more than 40 launches required to assemble the station. What is the reasoning behind the construction of the ISS, and how much of it can be justified? With its roots back in the days of the Cold War, the space station was to be a reply to the development of the Mir space station by the USSR. Space station Freedom, so named to challenge the soviet political system, was championed by Ronald Reagan during his State of the Union address in 1984. Just as John Kennedy years earlier had called for America to place a man on the moon, Reagan urged the United States to build a space station within 10 years. The estimated cost at that time was around $8 billion. The following 10 years did not go according to plan for the National Aeronautics and Space Administration (NASA). Under increasing pressure from the Soviets, who were preparing to launch Mir, they began cutting costs and corners, a fact that significantly contributed to the Challenger shuttle disaster in 1986. Seven American astronauts died during that ill-fated launch, and the shuttle fleet was grounded for more than two and a half years as NASA reassessed the safety of its program. By 1990 the $8 billion assigned to the space station project had nearly all been spent, and the station had not even left the drawing board. By the end of George Bush's term as president, repeated redesigns had escalated the cost of the space station to around $30 billion. With the Cold War officially over, the space station became a politically defunct project. With the Cold War officially over, however, the space station became a politically defunct project. Yet it supported aerospace industries across a significant majority of American states. 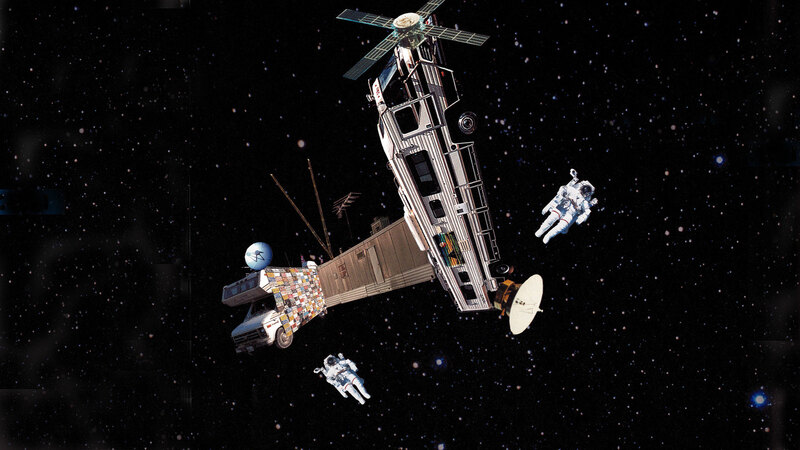 This meant that for newly elected president Bill Clinton, the space station remained a political necessity. A new justification had to be found for retaining the program. The ongoing financial crisis in Russia, however, has caused additional problems for the program. Russia's involvement no longer serves as a cost saver. Rather, NASA subsidies are needed for the Russian Space Agency to maintain its ISS program. Because of this and other factors, the ISS is now more of a financial burden to the United States than ever before. Still, supporters continue to defend the cost of the program. One of their main justifications is the expected scientific and technological return. Scientists hope that studying the effect of microgravity on the human body will provide insights into the way the body works. Such research on board the station promises to revolutionize medical treatments for certain conditions. The pharmaceutical industry also expects advancements that will help it improve drug design and hence the treatment of disease. Technological advances associated with the station are more obvious and immediate. The development of systems required for the ISS itself will result in spin-off products in other industrial sectors. Teflon is a good example. First developed for the heat shields used in the Apollo program to protect the command module during reentry, it is now commonly used as the nonstick component in cookware. NASA estimates that for every dollar spent on space programs in general, at least two dollars are returned to industry from technological spin-offs. In addition, some of the onboard research projects that are expected to provide insights into industrial processes cannot be replicated on the ground, providing further justification for the ISS program. All of these factors notwithstanding, there are a growing number of scientific challenges to the rationale for the huge expenses involved. Some scientists feel that the added cost of carrying out experiments on board the station rather than on the ground cannot be justified. This point of view is validated by the lack of industrial investment in the project. If it were not for the political will behind ISS development, it is certain that the project could not survive. Though the justification of possible breakthroughs in science and technology obviously benefits the station's cause, such hope is clearly not the prime motivation. It becomes apparent that the space station is really about space exploration. The human exploration of space, according to those who control the space programs of North America, Europe, Russia and Japan, will begin with the establishment of human outposts on the moon and later on Mars. But neither of these is possible until a permanent base—a space station—has been set up in Earth orbit. Such a base would provide the facilities for building manned interplanetary craft. These craft, because they would be built far above Earth, would not have to withstand the incredible pounding all craft undergo as they pass through Earth's atmosphere. Their design could therefore focus on the ability to travel the huge interplanetary distances more quickly and efficiently. In many ways, the ISS is the pinnacle of political, scientific and technological achievement, combining the resources and efforts of a significant portion of the world's population. It could be considered a statement of mankind's supremacy over the natural world, a monument to what humans can achieve when they work together. As such, the International Space Station may be a noble cause. Exploration has always been a driving ambition for humankind, and the combined international effort can only promote better relations between the countries involved. Arguments that such huge sums of money could be better spent on humanitarian efforts tend to fall flat when one compares the cost to other areas of the U.S. budget; for example, the annual military budget of the United States is more than five times the total cost of the ISS. The problem is not a lack of financial resources for humanitarian projects, but the political will to direct such resources appropriately. This past century was supposed to be one where technological advancement cured humankind's ills. Yet our society, while full of so many technological marvels, is also still full of disaster and misery. In fact, in many ways, things seem to be getting worse. Scientists have become the sages of our modern society, and science a popular religion in itself. In a world where all too often God has been rejected by society and His influence removed from our individual lives, perhaps we should think more deeply about some of the attitudes that drive continued scientific advances. Society relies on its science experts to say what foods we should eat, what activities are hazardous to our health, and where life came from in the first place. Scientists have become the sages of our modern society, and science a popular religion in itself. We rely upon scientific evidence for much of what we believe, and we are encouraged to reject that which cannot be scientifically proven. Would it not be wise to rethink the place God occupies in our personal lives, in our morality and ethics, and in the decisions we make—even at the national and international level? Perhaps we should also consider our attitude toward the great prosperity we in the so-called developed nations enjoy—a prosperity that underpins all scientific progress. Is prosperity—and all that flows from it—the result of our own ingenuity, or is it a blessing from God that He can just as easily take away? Food for thought, some might say, but what does this have to do with the ISS? Simply this: The Bible outlines God's incredible purpose for the human race, and our amazing potential and future. It reveals that the earth is man's domain at this time. God has—deliberately, it seems—restricted its life-sustaining atmosphere to a relatively thin layer around the planet, and He has designed humankind to function efficiently within it. The vast cosmos is, for all practical purposes, completely inhospitable to human life. It may come as a surprise, however, to learn that God's plan and purpose for humankind following this physical life is to change our physical bodies—as a result of a resurrection—to “spiritual bodies” (see 1 Corinthians 15:42–44). We will become fully “partakers of the divine nature” according to 2 Peter 1:4, sharing God's plane of existence and joining His spirit family, which the Bible reveals rules the universe. In the meantime, God tells us that “the heaven, even the heavens, are the Lord's; but the earth He has given to the children of men” (Psalm 115:16). It is ironic that while significantly failing in the most basic God-given responsibility to “tend and keep” our physical environment (Genesis 2:15) and to get on well with those around us, we are possessed with the idea of exploring the heavens—God's domain—before our time. The scale and hostility of the cosmos with respect to mortal life suggests that its exploration and development is a task best left to a later stage of God's plan for humanity. For instance, God has scattered astral bodies beyond our galaxy at such enormous distances that it would take multiple human lifetimes to reach even the most accessible of them. The scale and hostility of the cosmos with respect to mortal life suggests that its exploration and development is a task best left to a later stage of God's plan for humanity. It is our human destiny to become immortal one day—provided we “bow the knee” to God and to His Son, Jesus Christ (Philippians 2:9–11). The Bible hints at the future prepared for those who will eventually be part of the family of God: “What is man that You are mindful of him? . . . You have made him a little lower than the angels. . . . You have put all things in subjection under his feet” (Hebrews 2:6–8). This passage harks back to Psalm 8:4–6, in which King David contemplates the stars of heaven and ponders human destiny. The verse in Hebrews expands on David's words: “For in that He put all in subjection under him, He left nothing that is not put under him. But now we do not yet see all things put under him” (Hebrews 2:8, emphasis added). “All things” refers to the entirety of God's creation—the heavens as well as the earth. Once humans have attained their God-intended spirit composition, then—and only then—will they be ready to explore the far reaches of the universe.